The report behind WISEware's web-based, easy-to-use, end user reporting tool. Designed to help you create insightful ad hoc reports when you need to find instant answers to specific business questions without waiting on an IT response. Collect data from your internal systems, prepare it for analysis, develop and run queries against the data, and create reports, dashboards and data visualizations so you have the information you need, when you need it. WISEreport is a simple report definition tool to create formats for presenting data defined with WISEdata. The visual query builder lets you build complex SQL queries without the need to write any SQL code. 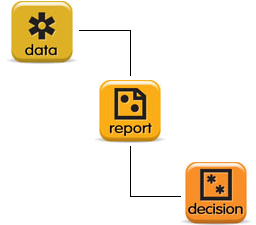 Ad hoc reporting quickly generates reports that meet individual information requirements with ease. This allows you to dynamically modify and drill through report data for powerful information retrieval and analysis. Reports can be and look as simple as a one-page data table or as complex and rich as interactive tabular or cross-tab reports with drill-down features. Drill-down parameters permit easy transitions from one report to another. Dashboards and data visualizations make the analytical results understandable to all users. WISEreport options for formats include simple tabular, columnar, or visual charts, including pie, bar, and line charts. WISE and WISEware's ad hoc reporting solution does not charge per-user fees. If the benefit of ad hoc reporting is that of empowering end-users, it should not come with a user-tax in the form of per-seat licensing. Depending on your needs, a WISEdata, WISEreport and WISEdecision solution can be tailored to meet your business and financial requirements. For more information on how to have WISEreport working for your organization, contact WISEware.